"Is the colour of my skin a problem? Why wouldn't people want to read it?" Arnold Henry (L) and son Amarion (R) in the children's book "Daddy's Mini-Me." A children's book about the relationship between a black father and his young son could be on bookshelves soon, but its author needs the public's help to see his dream come true. In February, St. Lucia native Arnold Henry's book, Daddy's Mini-Me, was rejected by a literary agent because they felt there was no market for stories about "African-American 'fathers.'" 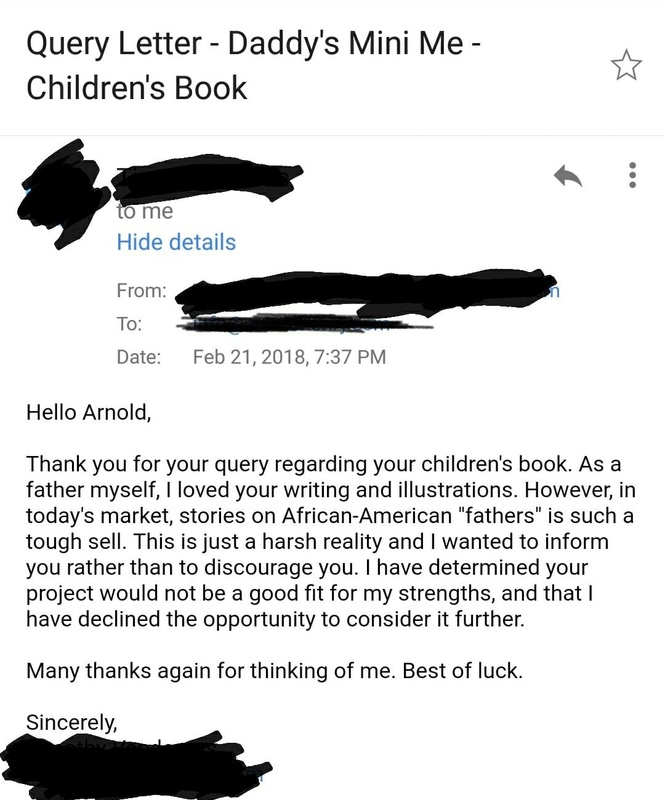 Email sent to Arnold Henry by a literary agent regarding his children's book. "Am I pursuing the wrong children's book? Is the colour of my skin a problem? Why wouldn't people want to read it? I was very discouraged," Henry told HuffPost Canada in a phone interview regarding the rejection letter, which he says noted that stories about black fathers are "such a tough sell." "I'm a really proud father. It means the world to me and I just wanted fathers to have something to read to their children," Henry said. 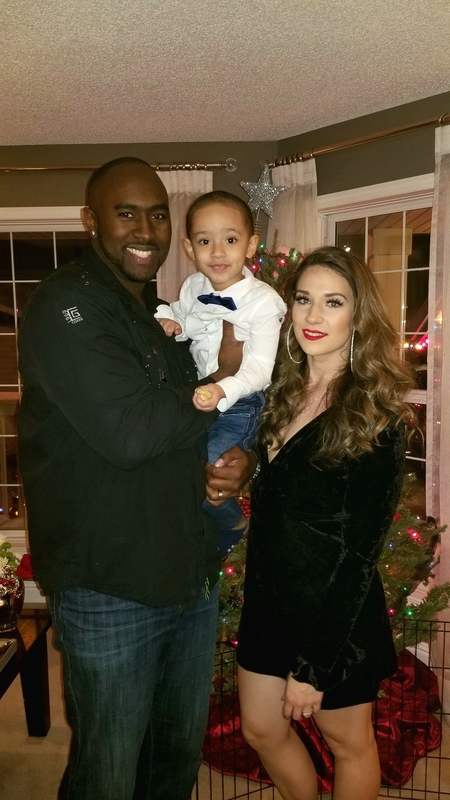 Now, Arnold, who currently lives in Chestermere, Alta., with his wife, Stephanie, and their three-year-old son, Amarion, is trying to self-publish his book with help from Kickstarter, with the goal of raising $10,000. He also wants to use his book as a way to give back to disadvantaged youth: a percentage of sales from Daddy's Mini-Me will go to non-profit organizations that work with children in foster care and youth development. After Henry posted a photo of the email exchange he had with the literary agent on Facebook, he says he received encouragement and support from members of groups such as Single Dads, A Bunch of Dads, and Black Fathers. "When I posted the [email], [the members of the Facebook groups] said to self-publish and they would support [the book]," Henry said. Arnold Henry and his son Amarion. Henry, 33, wrote his book — a collection of moments from Amarion's early years — when he took a year off work to spend time with his little one. The book, illustrated by Ted Sandiford, an artist and father of six based in St. Lucia, is intended for newborns to children aged four. Henry says Daddy's Mini-Me is a book for dads like him. "There should be more books out there for fathers and sons. I was able to experience the early stages of [Amarion's] life. To realize how much of a role model fathers are for their children ... fathers are important, just as mothers," Henry said. It was the realization that he needed to be there for Amarion, especially when he was young, that inspired him to write the book. "For the first time ever, I found myself in a father-son bonding moment," Henry said on his Kickstarter page. "On that same day, I made a promise that history will never repeat itself and I will always be there for my son." Arnold Henry, his son Amarion, and his wife Stephanie. Noting to HuffPost Canada that he didn't have a "father-son bond relationship" with his own father, who died eight years ago, Henry said, "You have no idea how long I wanted to be a father. I look forward to every day and to seeing how I can bring more joy and happiness into [Amarion's] life." So far, Henry's Kickstarter has raised more than $5,000 and he hopes to reach his goal by early April so Daddy's Mini-Me can be in parents' (and kids') hands before Father's Day, June 17. And although he's optimistic about seeing his book come to fruition, Henry's publishing dilemma isn't uncommon. In 2016, the Cooperative Children's Book Center (CCBC) at the University of Wisconsin, Madison's Education School found that out of 3,400 books they reviewed, only 427 were written or illustrated be people of colour, and just 736 of them were about people of colour, NPR reported. Canada too is no stranger to under-representation of black authors. By 2012, 20 novels written by 12 African-Canadian authors had been published in Canada since the beginning of the 21st century, and just two of them were first-time authors, Zetta Elliott, assistant professor at the Center for Ethnic Studies at Borough of Manhattan Community College, noted in the Federation for the Humanities and Social Sciences' website. Canadian author Madeleine Thien in 2016. In 2013, Canadian author Madeleine Thien discussed the under-representation of Canadian writers of colour nominated for major awards while speaking at the literASIAN writers festival banquet in Vancouver. "It's worth noting that in 10 years of the Writers' Trust [of Canada] Fiction Prize, only eight non-white writers have ever been nominated," Thien said. ​"And this number includes [Lebanese-Canadian] Rawi Hage three times. In fact, until [Black-Canadian author] Esi Edugyen [was nominated] in 2011, no women of colour had ever been nominated in the history of the prize," the 2016 Scotiabank Giller Prize winner added.